Air Box to Throttle Body Clip? K100-forum.com » Technical, repair and troubleshooting » Engine and transmission » Air Box to Throttle Body Clip? Quick question i’ve taken the throttle bodies off the air box so need to replace the clips. What part do i need to order? Also how do you fit the clips is there a specific method or tool? Alsooo, is there a difference between upper and lower clip? Mate, by now you've learnt that it's never a quick question. Clips or clamps? There are three different sized clamps for 8V engines, TB to airbox and rubber intakes. 11 61 1 460 940 x 4 are 46mm. 11 61 1 460 901 x 4 are 50mm. 11 61 1 460 900 x 4 are 48.5mm. If your bike has the original Oetiker clamps a special tool is useful, but not required. If someone has replaced them with worm gear type clamps, then re-use them if not damaged. I use pinch pliers ('dykes' or sidecutters work but not as well due to the angle) to pinch the clamp closed when it's in position. They're easily prised open with a suitably sized flat blade screwdriver, but you'll probably stuff them up for re-use. ETK is a bit confused as to what sequence they go in so you have to look in section 13, fuel supply - TBs, as well as in section 11 - engine, last page, where the airbox is shown. @Two Wheels Better wrote: Mate, by now you've learnt that it's never a quick question. Oh my god how simple I thought it would be . 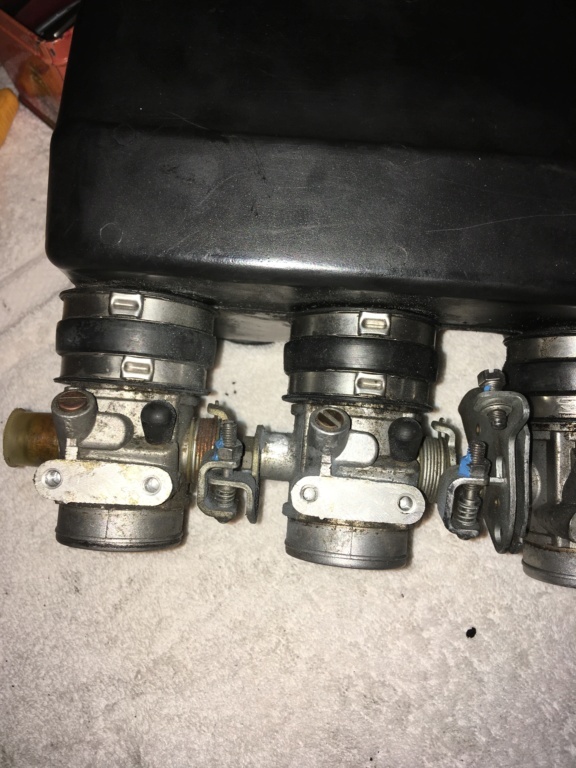 Which lead you to either upper or lower airbox "clip" however they are exactly the right price, part number, BMW specific part number and both 48.5mm. Ahh so looking at the link you attached I need part No. 11611460901 and 11611460900. Looking one Motoworks '901 is called "Plenum chamber to throttle body duct clip 50mm" and the '900 is called "Airbox to throttle body duct lower clip 48.5mm"
Best and easiest thing to do is to carefully observe the diameter where all three of the clamps are seated between the airbox and throttle bodies, and again at TB base to rubber intakes, whack a caliper onto the space and scrutinise the differences. You're there, it's all within reach. Those fractions of mm's make a big enough difference between an easy fit when reassembling, or some colourful words added to your vocabulary. @Two Wheels Better wrote: Best and easiest thing to do is to carefully observe the diameter where all three of the clamps are seated between the airbox and throttle bodies, and again at TB base to rubber intakes, whack a caliper onto the space and scrutinise the differences. You're there, it's all within reach. Those fractions of mm's make a big enough difference between an easy fit when reassembling, or some colourful words added to your vocabulary. haha that last bit made me laugh. Yeah that sounds like a plan those diagrams you attached were so helpful though thank you! Only ever removed the clips from the top of the throttle bodies when removing plenum, I always use pure silicon grease sparingly helps keep the rubbers supple, had them of three or four times now and I secure them with tie wraps never had a leak, saves a hell of a lot of messing about. » Throttle body piece broke.